It’s almost Easter! How do you plan to spend it with your toddler? If you’re unsure you won’t want to miss the ideas below! Easter is a fun celebration packed full of great traditions. Toddlers may not be old enough to understand the concept of Easter, but they can still have an awesome time. 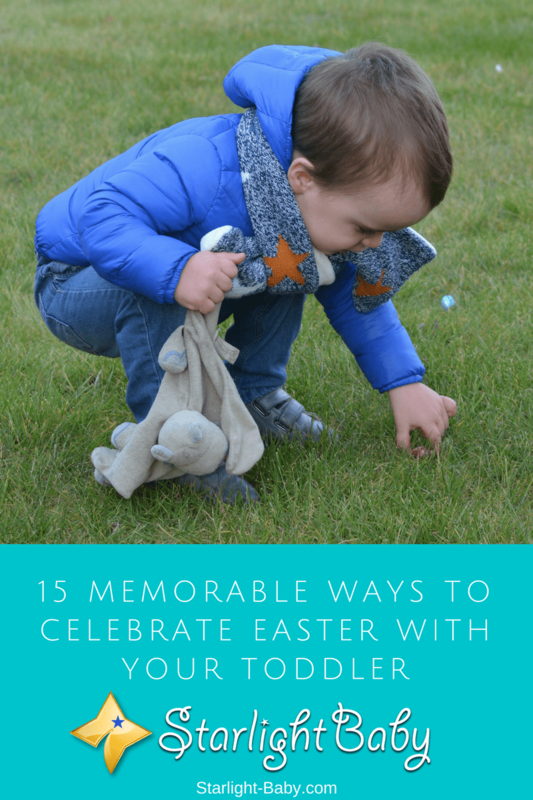 So, if you’re struggling for inspiration, here you’ll discover 15 ways to celebrate Easter with your toddler. Easter is the perfect time to say goodbye to winter and welcome the spring. One of the best ways to celebrate this is to create your own Easter garden. Now, you have a few options here. You can either plant your own seeds which you and your toddler can grow together. Or, you can opt for a ready-made garden. Investing in flowers which have already grown, produces instant results. This option may be best if you don’t think your toddler will be patient enough or interested enough, to wait for flowers to grow. This is an awesome idea because it can really help with your toddler’s development too. So, you’ll be having fun while educating your toddler at the same time. Gardening is a skill they’ll be able to take with them throughout adulthood. Of course, no Easter celebration would be complete without Easter cards. You and your little one will have so much fun creating your own cards. There’s also numerous ways you can do this activity. One idea is, rather than drawing a design onto the card, your toddler could instead use Easter themed stickers. Or you could draw an Easter themed object and your toddler could colour it in with paint. You can experiment with all kinds of craft materials, just make sure they’re toddler friendly. Another classic idea that had to have a spot on the list is decorating Easter eggs. Hard boiled eggs make an excellent canvas, but if you’d prefer not to waste eggs, why not use plastic ones? Your toddler can then paint the plastic eggs. You could even dye them in toddler-friendly paint and record the experience. Your smartphone or tablet can capture the moment which you can look back on in many years to come. Fancy getting out of the house? Easter egg hunts are by far one of the most popular ways to spend Easter with toddlers. There’s nothing quite as exciting for your little one than trying to find chocolate Easter eggs. Of course, they don’t have to be made from chocolate, you could also hide decorated eggs, it’s just a LOT more fun for your toddler if it is chocolate that they can eat later. You can either host your own Easter egg hunt or take them to a local one. There’s sure to be at least one Ester egg hunt going on in your local community. As spring symbolizes fresh new beginnings, why not take your toddler to a local farm to see the baby animals? Lambs are especially adorable in spring, so your local farm is sure to have plenty of them! Heading out to the farm is another educational activity too. It may not be solely about Easter, but you can use it to teach your little one all about the different animals they see and interact with. You could even tell them why lambs are associated with Easter, though they may not be overly interested. Toddlers love a good story so why not invest in some Easter themed books? These can teach your toddler more about the Easter holiday in a way they understand. Well, that is of course if you choose a toddler-friendly Easter themed book and not just a standard Easter book! Why not try and see if you can find audio books too? These really grab a toddler’s interest an you can enjoy giving your voice a little rest. Baking is another awesome idea. Toddlers love to get involved in the kitchen, especially if it’s to create their own Easter treats. You can bake Easter themed cupcakes, cookies or even an Easter cake. Obviously, your toddler won’t be able to do much of the baking. However, you can find toddler-friendly utensils which allow them to do tasks such as mixing batter and pouring ingredients in to a mix. They’ll be so excited to help you and it’s a fantastic bonding experience. Not to mention the fact you’ll have some delicious Easter treats to enjoy as a family. Easter baskets are a great tradition a lot of parents get involved with. They actually date back for hundreds of years, making them one of the oldest Easter traditions in existence. Getting your toddler involved helps to make this tradition even more special. If they have siblings, they could help you to create a basket for them, while their siblings (or you) create a basket for your toddler. This actually gets your children to learn more about one another and teaches them the act of kindness. There’s a lot of different Easter basket ideas out there. So, if you get stuck for inspiration, just do a quick search online and you’ll discover all kinds of Easter basket ideas. Does your toddler love to get creative? If so, Easter art is definitely an activity to add to the list. Get them to either draw an Easter image, or simply print one out and let them color it in. You could even buy them an Easter themed coloring book or activity book. Take a look in your local book store, or online and you might just be surprised by the number of toddler-friendly Easter activity books available. We already mentioned how integral lambs are to Easter earlier on, so why not celebrate this cute and cuddly animal by creating adorable spring lambs? There’s a lot of different ways you can do this activity. Red Ted Art has an impressive list of 30 different lamb crafts you and your toddler could partake in. Once created, you can save these lambs until next Easter and use them as ornaments. Another great way to celebrate Easter with your toddler is to host an Easter brunch. Sitting down with the family and enjoying a nice Easter themed brunch is the perfect way to start the day. You could host brunch, then crack on with the Easter egg hunt afterwards. This is also a great way to get all of the family involved. Invite your parents, siblings and their children to make it extra special for you and your toddler. Or, simply enjoy a nice relaxing brunch with just the two of you. One thing that’s guaranteed to keep your toddler entertained for an hour or two is an Easter movie. You’ll already know toddlers are more than capable of watching he same thing over and over again. So, why not give them (and you) a break by giving them something new to watch? There’s all kinds of adorable Easter kids movies you can watch so why not invest in a few of them and enjoy a family Easter movie day? Although this is technically Easter egg decorating, it totally deserves a spot of its own on the list. Your toddler can use a toothbrush dipped in paint to create awesome, colorful eggs. Simply hold the toothbrush up in the air, then bring it down quickly, flicking the paint onto the egg. Now, as you can probably tell, this idea is a messy one! So, you’ll want to have a dedicated space where your toddler can make a mess without causing permanent damage. Easter bonnets are another popular tradition that’s fun to follow. You and your toddler can create an adorable Easter bunny hat. Once it’s made, you can also take photos of your little one wearing their own creation. This can then be used in years to come to embarrass your child and remember the awesome memories you created together. There’s a lot of ways to create Easter bunny hats. Why not check out this useful video showing you how to create a simple yet adorable bunny hat? Finally, what better way to celebrate than to get dressed up? Your toddler is sure to jump right onto this idea! You’ll find it adorable seeing your little one in an Easter themed outfit, but don’t forget to join in yourself. Dressing up as a family can be super-fun and think of the photos you’ll be able to save from the day. Sometimes it’s good to be able to act like a kid again, so let your inner child loose and enjoy a fun Easter dress-up session! These are just 15 awesome ways to celebrate Easter with your toddler. There’s not long left to wait for this fun holiday, so start getting prepared now. How do you plan on spending Easter with your little one? Share your ideas below! We have this tradition of watching Easter movies during this period, especially the passion of Christ. It helps rear in us the essence of Christ dying for our salvation. I don’t think my family has ever missed watching Easter movies anytime we are in this time of the year. Taking the toddler out to watch movies is one of the best ways that parents can get to connect more during the period of Easter and the good thing about that is the little one get to see what Easter is all about in the way the passion of Christ movie is being set out. Wow! I love the way you celebrate Easter. It’s a great way to remind us of God’s love 🙂 Thank you for sharing how you celebrate it. These are great ways that we can get to enjoy the Easter period with our children and one of them is getting the Easter story book for them to read. One thing that is always fresh on my mind is those times that I always enjoy the Easter period by reading some books which has contributed to the way I developed the reading culture in me. Going to farm is another good way to have some good time out. My cousin brother actually enjoyed reading Easter event books especially the ones with cartooned images and an accompanying story in it. I enjoy seeing him and his siblings make jest over who look like a character in the story book. It’s such a wonderful memory if you get to spend it with family and friends. Wonderful to hear about your Easter readings. Yes, it’s a great way to encourage kids to become readers. Good job! Easter books is one of the best ways that we can get those around us to have the desire to read. This is one of the reasons I always buy books even as I am old enough not to read those kids books. I feel good when I read such books that reminds us the essence for the celebration of Easter. LOVE all these ideas!! Thanks for including our Egg Roll Activity!